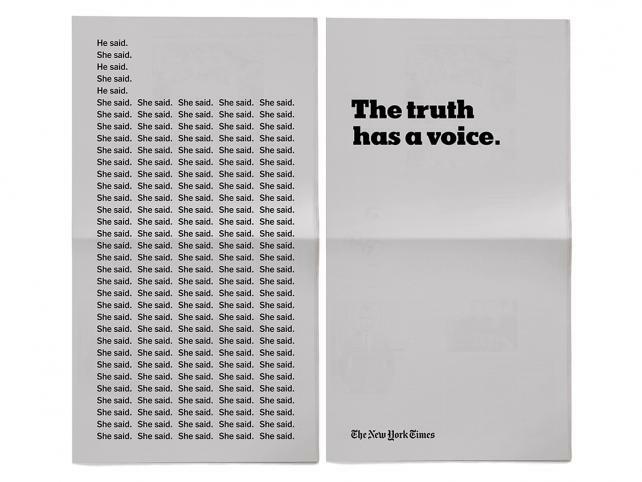 The New York Times is continuing its year-long Truth campaign with this spot on Sunday’s Golden Globes broadcast, spotlighting its coverage of sexual harassers from Weinstein to O’Reilly to dozens more. Interestingly, neither ad plugs the nytimes.com/truth link, which previously led to the Times subscription department. Now it leads to . . . the Times subscription department. Truth is, leaving it out seems like a wasted opportunity. This entry was posted in Uncategorized and tagged Academy Awards, Ad Age, Ann-Christine Diaz, Bill O'Reilly, Golden Globes, Harvey Weinstein, New York Times, Truth campaign. Bookmark the permalink. Isn’t it ironic, John, that newspapers, the alleged sources of truth, have to advertise their “committement” to the truth? What ever happened to the concept of “the truth” speaking for itself? It would seem to me that papers like the Times and WaPo have a little itch in the backs of their mind that Donald Trump, for once, is telling the truth. C’mon, Mudge – you’re smarter than that. You know there’s a spectrum here: careless errors, factual mistakes, overzealous reporting (yes, much of it anti-Trump, but just as much pro-Trump), downright boneheadedness, etc. None of that is what Trump wants to convince America is fake news. As I’ve written several times (http://bit.ly/2DfGfA4), this whole Pep Squad for Truth campaign is an empty exercise: Half the audience already believes it, the other half never will. Even so, the fact remains that the news organizations for the most part correct their errors. Trump never does. Happy New Year, John, and to the leader of your blogs, Mrs. Campaign Outsider, too..
Keep the commentary and art reviews coming. It’s all a part of what makes your blog so interesting. I was merely commenting, John, on how sensitive that the Times and WaPo have become over the issue, particularly since both publications had a pretty questionable performance over the past year or so. They are defensive are they not? The question that comes to mind is whether or not the Times’ new publisher is exercising the right of the owner to alter the tone and ideological leanings of the paper’s offerings. If he is, it might just be interesting and profitable “Times” for that one-time newspaper of record. Thanks for the kind words, Mudge (and the Missus says hi). No question the Times and Post are defensive – then again, they’re seeing major revenue increases from the Trump Bump in print and digital subscriptions. So you do the math. As for armchair psychiatry, I’m a strong supporter of the Goldwater rule. Let’s judge his actions, and leave it at that.